Gullen Range Wind Farm: REC fraud in the making. The Gullen Range Wind Farm has been a disaster from the get go (see our post here) – with hundreds of homes lined up as sonic torture traps (see our post here). There are 32 non-involved residences within 1.5 km of the turbines; about 60 within 2 km; and 118 within 3 km. Within 5 km there are about 240 non-involved residences. The planning “process” has been high farce from go to whoa. The locations of 69 of the 73 turbines were changed from those authorised in the Project Approval, without the proponent, Goldwind bothering to seek approval for the changes; until after the event. Why bother when you’ve got the Department in your back pocket, hey? The so-called “independent” Environmental Representative – Erwin Budde – whose job was to ensure compliance with the planning permit, is anything but independent. Budde – is the Director of a consultancy that has been flat-out working for the proponent since 2007. Budde was, apparently, quite happy to sign off on all the developer’s location changes, which the Department of Planning now accepts were unauthorised (see our post here). In a “too late she cried” decision, the Planning Assessment Commission has slammed the developer for its flagrant breaches of its planning permit as “inconsistent with the intent and spirit of the Draft NSW Planning Guidelines” (see our post here). Now the Planning Minister, Pru Goward has weighed in to order Goldwind to comply with the condition of its planning consent going to the precise location of its turbines. Here’s the ABC’s take on the latest in the Gullen Range fiasco. Legal action has been launched against the company behind a wind farm near Crookwell over turbines built in the wrong locations. Earlier this year, the NSW Department of Planning and Environment said it had become aware that 69 of the 73 turbines at the Gullen Range Wind Farm had not been built in approved locations. Some were up to 187 metres from where they should have been. The company, Goldwind Australia, applied for a modification to retrospectively alter the location of the turbines, but last week that was rejected by the Planning Assessment Commission. The Department said it has started legal proceedings against the wind farm which has 21 days to respond to a draft order to move nine turbines. It said if the company challenges the order the matter could be taken to the Land and Environment Court. The Department said it has rigorously investigated the complex legal issues around the Gullen Range Wind Farm building turbines in locations not specified in the approval. It said while the company claims it acted within its approval conditions, the Department shares the community’s opinion that the new positions of the turbines are not consistent with the consent conditions and have negative impacts on nearby residents and environmental areas. A statement from a Departmental spokesperson said it is not reasonable to say that turbines located up to 187 metres from the originally approved location constitute ‘minor’ changes. It said the Department will take every reasonable course of action to get the best possible outcome on behalf of the community. However, a campaigner against the Gullen Range Wind farm isn’t satisfied. David Brooks of the Parkesbourne-Mummel Landscape Guardians said the Department hasn’t gone far enough. “The Department of Planning and the Minister indeed are not enforcing the PAC determination because the PAC determine was that all the 69 turbine locations were unauthorised and could not be approved,” he said. “We will be pointing out to them that what they should be doing is ordering the company to dismantle the 69 turbines, to dismantle the 69 turbine footings and to rehabilitate all those areas. That’s what they ought to be doing,” Mr Brooks said. Goldwind Australia Managing Director Goldwind’s Managing Director, John Titchen, has told the ABC the company is considering its response to the Department’s action. Following last week’s PAC ruling he said the company’s assessment was that all the turbines locations are consistent with the project approval. Here is an interview with Pru Goward on Alan Jones’ Breakfast Show (transcript follows). Alan Jones: You couldn’t pay some of these people enough in government. I think the Planning Minister Pru Goward – I don’t know what is impossible – but I think her job is almost impossible. She heads a Department which I believe, we’d be better off without. Who have advised on so many unbelievably critical areas. Remember earlier this morning I talked about Bronte and Tamarama? She released a statement on Friday, Pru Goward, about this Gullen Range Wind Farm. Now there are 200 homes. This is totally in breach of everything that it ought to be abiding by. Totally in breach, this Gullen Range Wind Farm. And there are 200 homes within 2 km of the Gullen Range turbines – 200 homes. It is planning and public health disaster. This is near her electorate. Now she’s responded to a draft order to move the turbines. I’ll come to that in a minute. And basically, she’s given this Gullen Range outfit 21 days to justify why a full order should not be imposed, ordering it to move the turbines. And basically all Pru Goward is trying to say is that they’d have to abide by the approval process. In a press release, which might have been a bit unwise on Friday, she said “The Crookwell and wider Southern Tablelands communities can rest assured that the Department, that’s the Department of Planning and Environment, will take every reasonable course of action to get the best possible outcome on behalf of the community.” Well all I can say to her is good luck. She’s on the line. Pru Goward, good morning. Pru Goward: Good morning Alan. Alan Jones: Simple question. How can this wind farm be allowed to operate when it’s in breach of an order given by Kristina Keneally when she was the Planning Minister? And it’s in breach of the Land and Environment Court order given subsequently, which basically said, you can’t shift these wind turbines where ever you want. They have to be located where they’re nominated in the consent documents – and they’re not. Why shouldn’t this mob be turned off today? Pru Goward: Well, they’ve got 21 days to tell us what they’re going to do in response to our order. That they stick to what they originally committed to do. And if they don’t, then they have to start taking down turbines. Alan Jones: But I notice on your, your, you see and I’m fairly sympathetic to your predicament, because, you can’t know everything and you’re getting advice from a Department. I noticed the figure 9 was mentioned on Friday. Alan Jones: Can I tell you that there are 69 of 73, 69 not 9, 69 of them. Alan Jones: She said, Keneally, that no turbines could be moved from the positions stated on the project application map. And because Keneally was so specific, in 2009, local community groups took this developer to the Department of Planning and Environment, took- Department of Planning and Environment to the Land and Environment Court and the Land and Environment Court ruled on May 7, 2010 that they couldn’t move the turbines. Pru Goward: Well the original approval, as I understand it said that would move them, they could move them a few metres. There had to be a little bit of latitude. Alan Jones: Well some of these were 150-170 metres …. Pru Goward: Yes, that’s right – they’re the nine, they’re the nine. Alan Jones: Now can I tell you where your problem lies, if you don’t mind my telling you so? Because the ruling of the Land and Environment Court stated that an independent environmental representative should be appointed to oversee the development. To ensure that it complied with the conditions of consent. And amongst the conditions was the fact that such a person must be independent of the design, construction or operational, personnel of the development. Well who was this so-called independent individual? Who? Pru Goward: Well, look, I mean that’s a fact that this…I mean that’s why we’re in this position, because things were not followed. Alan Jones: Can I answer my own question though? Alan Jones: The independent environmental representative was a Mr Erwin Budde. Appointed by your Department who is the Director of the consultancy company NGH Environmental which produced the original project approval application documents for the development. He’s not independent. And the residents informed your Department of Mr Budde’s conflict of interest, due to his Directorship of NGH which had been in the employ of the developers since 2008. And it was Mr Budde who gave compliance consent to the developer regarding the 69 illegally-placed turbines. So the developer can now say if you try and pull the rug from underneath them – hang on, hang on, hang on – we’ve only put these turbines where the independent environmental representative approved of our putting them. That is your Department. Pru Goward: And unfortunately all of that happened before I became the Minister. Alan Jones: I know, I know. Pru Goward: And you know how I feel about turbines, and they’re all through my electorate and I’m very conscious of the impact that they are having and that is why we now have given the company 21 days to do what is right and move at least nine that we recognise no Court could defend. Alan Jones: But there’s 69 of them. And the point about it is, it’s clear that the DPI, your Department, not you, your Department appointed a bloke who was not independent. He was not an independent environmental representative. This bloke had produced the original project approval application documents. Alan Jones: And he incorrectly gave compliance consent. And only weeks ago, in August, work recommenced on band 25 which is one of 16 turbines listed for a halt in construction and when the DPI officer, Karen Jones, there’s a name for you, was informed of this by residents, she responded by saying she just received a letter from Goldwind, this is the Chinese outfit that own them, saying that ‘it intended to recommence work as it didn’t like the Department’s recommendation document’. Pru Goward: Right. Now that, as I say, happened some time ago. I have to deal with what I’ve got. Alan Jones: That was in August, last month. Pru Goward: The wind farm was approved years ago and we have to deal with what we’ve got. And the company now has 21 days to explain why they agree or disagree with the order of the Department. If they don’t, then we have to consider legal options. Alan Jones: But do you understand that when you consider legal options, the developer will now say but hang on, hang on – your Department appointed an independent environmental representative and that independent environmental representative gave the go ahead to these 69 illegally-placed turbines, incorrectly. And you won’t have a leg to stand on in Court so Gullen Range Wind Farm goes ahead. Pru Goward: I think the Court will be able to sort through those issues and make the right decision. Alan Jones: But who in your Department, who’s still got a job now, who in your Department, was responsible for appointing a person who wasn’t an independent environmental representative? Pru Goward: Well as you know, within two days of being in the job, we moved on the previous Director General. We have a new secretary, Carolyn McNally, who is extremely aware of the need to up – up the capacity of the Department and there have been a number of senior executive changes and I think you’ll see the processes and the analysis will improve at every step. I mean this is, as you say, a big job. Alan Jones: Well I’ll tell you, my understanding, my understanding is this Budde, who should never have been appointed, was appointed by a fellow called Daniel Keany K-E-A-N-Y on the 31st of March 2011. And the DPI, your Department, you weren’t Minister, failed to ensure that the independent environmental representative was independent. Instead they appointed this Mr Budde, knowing full well he was associated with the developer. Now there’s something seriously wrong in that Department. Alan Jones: But as I’m speaking to you, these people are cranking up, they wouldn’t care about you or anyone else. And they’ve made that quite clear. They didn’t like the Department’s recommendation document. They’re going ahead. This Chinese outfit, and they don’t care about you, and they say well take us to Court. And they’re still, there still down there. Now surely the way out of this for you, isn’t it, is to have some sort of judicial inquiry into this? I mean, to cover up their negligence, someone in the Department, someone, has put forward a recommendation that makes the Department complicit in the illegal placement of turbines – contrary to Land and Environment Court, contrary to Keneally. They know now that you’ve found them out for being grossly in derelict of their duty and performance and now the way out now is to say ‘Oh well, shift nine, shift nine and the other 60 keep going. Yes we’ll approve the 9 to shift’. Wink wink, nod, nod. There’s 69 of them are illegal. Alan Jones: No, but the applic … they made an application, they made an application to, recently, to have, to move turbines, in any direction, up to 250 metres from the indicated position on the project application. Pru Goward: And they’re the ones that we are now telling them to move. And if the company objects, they can take us to Court, and we will defend our instructions. Alan Jones: But what about the 60 others? I mean, there’s any amount of scientific evidence, that anyone within 10 km of wind turbines has health problems. And there’s international scientific evidence, which your Department won’t present to you, which they ought to, that will dramatically prove that this is a public health disaster. I mean these damn things are up to 150 metres away from the original specified position. Pru Goward: Yes, that’s right. But the advice is that because the approval was given for the 70 odd that we started with, it’s impossible to withdraw approval for all of them. But we can recog…we recognise that 9 – and Alan, remember this has never been done. No wind farm anywhere has ever been told – pull down a turbine. Alan Jones: I know that. I know. No, I am not having a shot at you. I’m simply saying these people still have to live with these things which are illegally built within 2 km of where they live. Pru Goward: I know, I know. Alan Jones: And in Ontario, on July 2011, the Environment Review Tribunal in Canada found, this case has successfully shown that the debate should not be simplified to one about whether wind turbines can cause harm to human beings. The evidence presented to the Tribunal demonstrates that they do in fact cause health damage if placed too close to residents. There’s 200 homes here within 2 km of these blasted things. Alan Jones: But they got it wrong last time. Pru Goward: Well they’ve never run one before. So, they have allowed proponents to run community (consultations). Alan Jones. Well, watch them. Alan Jones: These, these are the people that have given the approval to start with. Alan Jones: See, if you went to Macquarie Street, to work today in Parliament House. If you went to Parliament House, and said I’m Pru Goward, I’m the Minister. I can do as I like here. I’m going to drive my car up the right hand side of the road. 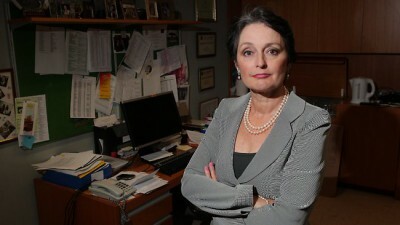 I wonder would someone stop Pru Goward in her tracks? Most probably take the car, most probably take the keys, and they’d certainly take you. Here is this mob down here, near Crookwell, driving down the wrong side of the road month, after month, after month, after month. And as I’m speaking to the Minister now, they’re still driving down the wrong side of the road. Pru Goward: And we considered an injunction and the problem with injunctions is that by the time you go through the injunction process, you’ve got your 21 days, so it’s better to have a directive straight away. Pull down the turbines and we’ll see you in Court if you don’t agree. Now they have 21 days to approve. I’ve got more to say about reform over the next few weeks. Alan Jones: Good. Well I’ll book you in for 21 days from now. How’s that? Pru Goward: Well that’s not bad. Well done. Alan Jones: There you are. Okay. Thank you for your time. Vintage AJ there: “tenacity” be thy name! The Planning Minister, Pru Goward inherited a disaster and is clearly out to turn it into something less than the debacle it is. Pru’s efforts to set things right are made all the harder by also inheriting a Department run on back-slaps, back-handers, cronyism and the groupthink born of hard-green-left ideology that turns giant fans into objects of worship among its staff of inner-city hipsters – “eco-crucifixes” – as James Delingpole calls them. While Gullen Range locals are out to force Goldwind to follow the law to the very last letter – keen to make it shift all 69 turbines – the end result is likely to centre around the 9 – referred to by Pru – that are way off target. Given the general arrogance displayed by Goldwind so far, it’s not likely to agree to move those 9 (and certainly not the other 60) – which is going to attract the attention of the Clean Energy Regulator. The CER is the Federal government agency that is charged with the responsibility of accrediting an “eligible power station” that generates an “eligible [renewable] energy source” – once accredited, it becomes an “accredited power station”. Accreditation means the power station is eligible to participate in the Large-Scale Renewable Energy Target and to be issued with Large-Scale Generation Certificates (aka LGCs or RECs) under it. Without a guaranteed stream of RECs for the next 17 years there would be no wind farm at Gullen Range; or anywhere else for that matter. Goldwind’s Gullen Range Wind Farm Pty Ltd became an “accredited power station” in November 2013 and, therefore, eligible to participate in the LRET and receive RECs. However, the entitlement to be accredited is subject to one or two rules under the Renewable Energy legislation, namely the Renewable Energy (Electricity) Act 2000 (Cth) (“the Act”); and the Renewable Energy (Electricity) Regulations 2001 (“the Regulations”). (b) the power station satisfies any prescribed requirements. (c) the power station must be operated in accordance with any relevant Commonwealth, State, Territory or local government planning and approval requirements. (3) The Regulator may, by written notice, suspend the accreditation of an accredited power station if the Regulator believes on reasonable grounds that the power station is being operated in contravention of a law of the Commonwealth, a State or a Territory. (4) The accreditation is suspended until the Regulator believes on reasonable grounds that the power station is not being operated in contravention of that law. The notice must include a statement to that effect. (5) The Regulator may, by written notice, suspend the accreditation of an accredited power station in any other circumstances prescribed by the regulations. (6) The accreditation is suspended for such period (including permanently) as the Regulator considers appropriate in all of the circumstances. That period must be specified in the notice. Note: Any electricity generated by the power station while its accreditation is suspended under this section is to be excluded from all calculations under section 18: see subsection 18(4). The fact that Goldwind’s Gullen Range Wind Farm Pty Ltd is unlikely to follow the direction given by Pru Goward to shift 9 turbines means its status as an “accredited power station” is under a cloud for two reasons. First, is that – under s30E(3) of the Act – “the power station is being operated in contravention of a law of … a State”; namely the Environmental Planning and Assessment Act 1979 (NSW). The Minister has made orders under that Act which, if ignored, will amount to a “contravention of a law of a State”. And second, that – under s30E(5) of the Act – the “power station” is not being operated in accordance with “circumstances prescribed by the regulations”; being, the circumstances prescribed by Regulation 4(1)(c): “in accordance with any relevant … State … or local government planning and approval requirements”. That Goldwind’s Gullen Range Wind Farm Pty Ltd is “being operated in contravention of a law of a State” and “not in accordance with State planning and approval requirements” is a legal “slam-dunk”. STT hears that Pru Goward is taking advice on her responsibilities to inform the CER that Goldwind’s Gullen Range Wind Farm Pty Ltd is being operated in contravention of State law and the terms of its planning and approval requirements. Giving notice to the CER might have to wait for the 21 day period which Goldwind has been given to respond to the Minister’s direction to pass, but after that there is no good reason why Goldwind should continue to enjoy accreditation. If it appears that Goldwind has no intention of remedying its contravention of its planning approval, the Minister should be recommending that the CER suspend Goldwind’s accreditation permanently – under s30E(6) of the Act. Accreditation is all about giving cowboys – like Goldwind – the opportunity to cash in on the energy market equivalent of the goose that laid the golden egg. So why would a Planning Minister sit back and allow Goldwind to flaunt the law and continue to reap its (completely) unjust rewards? Remember that the REC Tax/Subsidy has cost Australian power consumers $9 billion so far and will (if unchanged) cost us a further $50 billion over the next 17 years (see our post here). It seems only fair that where an outfit such as Goldwind hasn’t got the grace or ability to abide by the law, its entitlement to wallow in that enormous subsidy trough is pulled forthwith. It’s a simple principle: responsible governments apply the rules to prevent crooks – ready to abuse those rules – from profiting at everyone else’s expense: which is exactly what Goldwind are ready, willing and able to do. In substance, Goldwind is set to receive millions of RECs in circumstances where it’s not lawfully entitled to do so: STT calls it “REC fraud” – and it’s happening at plenty of other wind farms, including Waubra (see our post here). Pru, why not give the CER a call and bring a halt to Goldwind’s REC fraud, right now? give the CER the heads up about Goldwind’s massive REC fraud. Let’s not forget Acciona’s Waubra Wind farm. Here most of the turbines were moved, some over 100m. No compliance certificates to ensure placement was in the correct place. No tonality report available at planning stage (Waubra wind farm turbines produce Special Audible Characteristics (SACs) by design but ignored). No certification of the blades used. No allowance for the swooshing sound (SACs) 5dB. No independent complaints procedure used to ensure compliance to the noise standards used. A number of permit conditions abused and or corrupted. The developer made their own rules and the regulatory authorities never read them. Why read when you can make money and or feel good going down the path of least resistance when you can rub shoulders with the likes of Mr Andrew Thomson of Acciona and get the chance to shake his golden hand. Thanks Dan Tehan, Matthew Guy and Cr Clark. What I find unbelievable in this whole mess, is that Goldwind are apparently collecting RECs. How is this able to happen when they are in breach of their approval? When is someone in government going to grow some balls and stop this corruption? It is a fraudulent waste of our, the public’s, money and it’s fairly unlikely that it will ever be seen again. There should be no allowance for even ‘minor’ changes to positioning of these things. Before they submitted their application they should have ensured they could install them in the positions they have on their plans. Of course this is difficult when using computer modelling, but they should have gone to the physical location and undertaken geological, geographical and any other testing they needed to do to ensure they were being positioned accurately. For them to want to move positions by even a meter or two, is evidence their planning process was sloppy. Or they placed them on the plans in positions they knew would get them past the planning approval stage, with the intention to move them afterwards, which could be considered a fraudulent act. Such a situation should render the whole project at odds with original planning approval and even with later consents to alter positions. As the approving Minister stated no turbines could be moved, then even a ‘minor’ position change is against that ruling. 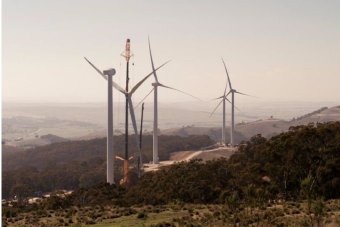 It’s not a matter of getting them to take down and re position 9 turbines; it’s a matter of who makes the regulations in NSW or indeed anywhere in Australia, our authorities or foreign or even Australian companies? Are we at the mercy of any person or company with the ‘front’ to ignore regulations everyone else has to abide by? I live in the shadow of the propsed Jupiter industrial facility (I refuse to call it a “farm”, just as I refuse to call EPYC “EPIC”. What I don’t understand, is that if the planned location isn’t suitable, and in Pru’s understanding could remain rubbery, what actual quality control is involved in the planning process itself? My fence line is surveyed to the milimeter, as are the 4 corners of my house slab. What would have happened if I found out when the builder formed up my foundations that it wasn’t suitable to be poured there? Council would have bounced me immediately if I arbitrarily built 50 metres from my plan and I would have had to remove my slab, site it correctly (to the millimeter) and start again. Either Goldwind didn’t survey correctly, or they never intended to place the monster anywhere near where they requested and simply submitted the paperwork with a suitable number of turbines, location TBA that suited their facility and their RET sponsored return. 69 turbines have been wrongly placed, 69 need to be re-sited. Not +/- 10 or 50 metres, but erected where they were approved, or not erected at all. On top of that, I would suggest thay whoever surveyed the sites should be forced to re-qualify and/or submit his equipment for recalibration. I won’t even go down the path relating to the arrogance of the proponent in asking for permission, being denied and then forging on anyway. Pru, you claim to be new to the job and somehow not responsible for what your department is doing. Now is the time to show some teeth, make a stand and show to all of the other foreign companies salivating over the opportunity to feast on the misfortune of the majority of landholders in these areas, and make a stand for now, and more importantly for you, the future. Deny responsibility for this mess if you must, but at least position yourself to be in a position to claim ownership of the fix. And, it may also be a prudent time to do your own investigation into the ever increasing research into the true health implications of these things, and the vast distances within which these risks remain. You, your department, your ancestors and for that matter your heirs and successors may well have some serious answering to do in the future, which may make the denials of James Hardie, the Tobacco Industry and the ACT’s Mr Fluffy debacles pale into insignificance. I had previously listened to the Jones and Goward interview and it caused me to pause for thought. Although it is arguable that 50 mtrs from the original planning consent could possibly be considered acceptable, I cannot see how it could be considered acceptable if it brings the turbine within the 2 km setback. After all, them’s the rules. Move the turbine or move the house, at the proponent’s cost. As far as I know and which I find totally unacceptable, as part of planning consent, the concrete and reo foundation are allowed to remain after decommissioning of the wind farm. But, and it is a big BUT, if the the turbine placement is deemed to not accord with the planning consent and therefore delves into the realms of illegality, naturally the foundation is illegal and should therefore be removed post-haste. The proponents will naturally argue difficulty and cost. Too bad. Remove it. It can be done. It is their responsibility as they knowingly did not follow the planning regulations. Incompetence, arrogance in believing they have planning departments “in their back pocket” just doesn’t wash. Yes, it has been evident for a considerable time now, proponents do believe they have governmental planning departments in their possession. As for the Gullen Range planning approval at CROOKwell, in part being made by a consultant who holds office in a company that is being paid by the proponent………..? Conflict and a seeming corruption of process. Enough is enough. It would be easy to suggest similar conflict exists in many, if not every approval of any industrial wind complex, the world over. The developer applied for approval. The PAC denied the developer approval. Is not the developer acting illegally right now? And doesn’t the CER already know this? Next it will be the 21 days being extended to 21 months. The PAC, the authorised independent authority has ruled.